Jersey City, one of the largest cities in the state, has multiple different neighborhoods that all have very distinct personalities. A while back, we toured the Aquí Market on Sip Ave in Jersey City, which is in the Journal Square neighborhood, a cosmopolitan and very diverse section of the city. We're here for Aquí Market's other location, in the far-south part of Jersey City on the Bayonne border, a quieter, more suburban neighborhood. 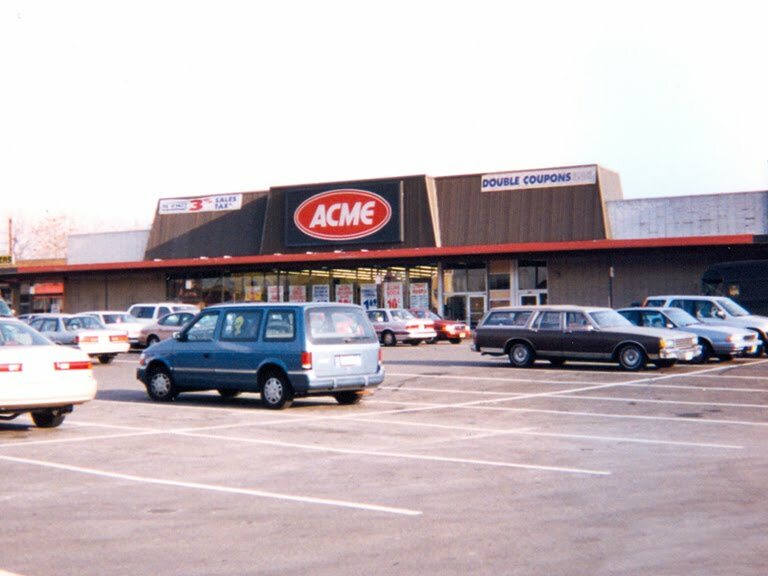 This store opened in the 1970s as an Acme. Photo from Acme Style, courtesy of Rob Ascough. 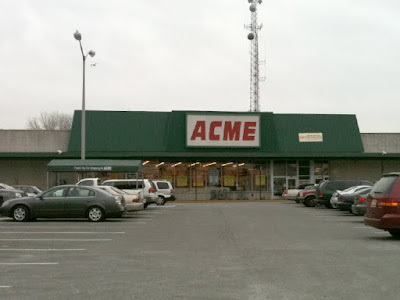 The Acme closed in 2010 and was replaced soon after by a Super Fine Fare. Fine Fare, as usual, didn't last. 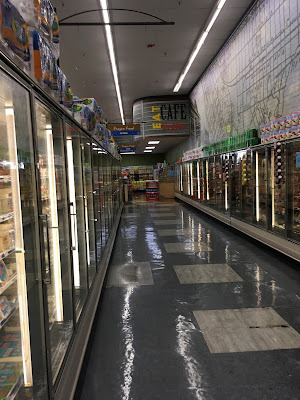 You can check out the interior of Acme and Fine Fare here on Acme Style. 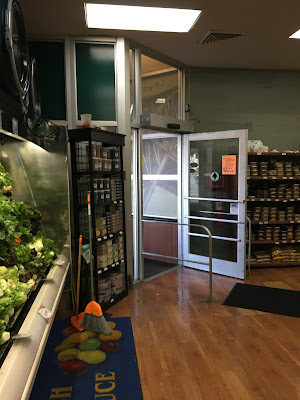 Soon after Fine Fare closed, Twin City Supermarket opened. Twin City is a local chain, and this store shared an owner with the Sip location and another store in Bridgewater, NJ. Circa 2015, that operating group decided to switch their stores to the new Aquí Market banner, while remaining in a part of the Twin City group. So although the store's name is different, they are still serviced by the Twin City warehouse in Elizabeth, NJ. The facade was renovated by the landlord when Twin City was in business, and was redone once more by the owners when the switch to Aquí occurred. An interior renovation coincided with the rebrand also. The wood (which is real, by the way), leaves, and stripe along the bottom were put up by Aquí. Hmm. It's been almost ten years and the cart corrals still say Acme (almost)? Maybe it's time for some new cart returns. The exterior is very nice. It looks a little more upscale, which fits the neighborhood. It's not very affluent but certainly not a poor neighborhood either. It's also interesting the neighborhood isn't that Hispanic, either. You enter into the produce alcove, which extends to your right, and which Aquí has fitted with really nice fake wood floors. Aquí has extended the produce down the first aisle, while dairy runs along the right-side wall. Meat, seafood, and deli are at the back of the first aisle; meat continues along the back wall, and strangely enough, milk is in the far back corner (despite dairy being in the first aisle). Frozen foods run along the last aisle. 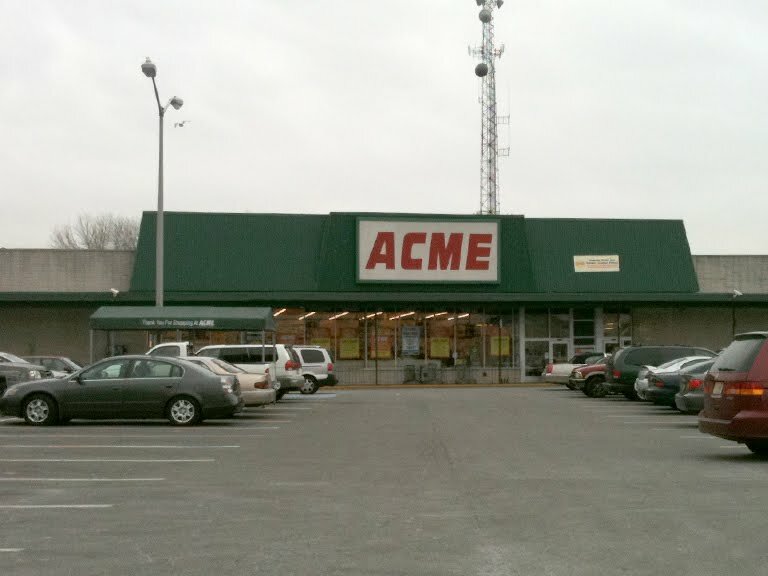 Acme's bakery has been removed. Very nice produce section with the floor and cases. Looking back at the entrance, which is very Acme-like. The ceiling in the produce alcove is very low, but in the rest of the store, it's exceptionally high. I don't know how high or why it is, but it makes the store feel very open. Overview of the produce alcove. Here you can see the expansion of the produce department Aquí added, with dairy along the side wall. Again, great wall graphics. Blurry picture of the dairy sign. Customer service is in the front of the first aisle. All the flooring has been replaced by Aquí. Also notice how the aisle markers hang over the shelves, not the aisles! It was pretty early in the morning when I visited, hence the empty store and boxes. The meat/deli/seafood counter is very large and is rounded, as is the sign hanging over it, which is pretty cool. Surprisingly, the floor is actually great in this store. So many urban/ethnic stores have beat-up, old white vinyl tile in the whole store ... including the other Aquí Markets! "Notice how high the ceilings are in this store. All the more reason to put some more exciting graphics and colors on the walls... in my opinion anyway." Well, I can safely say Aquí did just that! Frozen foods in the last aisle. No, there is no café in this store and I don't think there ever was. This front corner was Acme's bakery. Awesome map of Bayonne (just blocks away from the store) on the wall in the last aisle. Looking from the last aisle towards checkouts. Once again, the flooring is all-new. However, I think the checkouts are left over from Acme. This Aquí Market is definitely the nicer of the two I've been to, and I think it's their nicest store. I love the decor and the facility, but I don't know anything about prices or selection. Any input? Aqui did a very nice job fixing this place up! I especially like the design of the meat counter. They sure did, and the meat counter is very nice. More like what you'd see in a gourmet store than a lower-end ethnic market! I agree with you guys, I love the décor here! And it's even better with the extra-high ceilings. Unfortunately you can't really tell that until you visit. Acme Style mentioned it but I didn't fully appreciate that until I went. 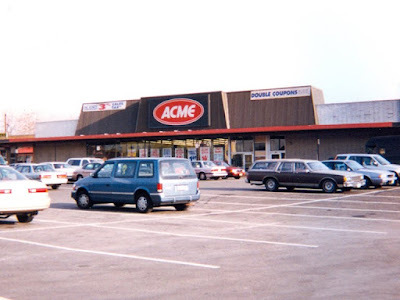 When i was a kid, this Acme was where my mother shopped most of the time. It's a rough neighborhood between Jersey City and Bayonne- the carts wern't allowed into the parking lot because people would steal them, so the local kids would hang out outside the place and take your groceries out of your cart and follow you to your car so you were more or less obligated to give them money. Maybe things have changed since the late 80's and early 90's. I see the last aisle (frozen food cases) is still uncomfortable narrow. This neighborhood didn't feel particularly rough, but I also know very little about it. You are free to take the carts into the lot now, although they most likely are auto-locking carts so they can't leave the property. Aquí fixed this store up with a lot more deluxe decor than their other two previous stores (Bridgewater and the one at Journal Square), so I assumed the area was a little nicer. In general, yes, the aisles are narrow with the exception of the first.